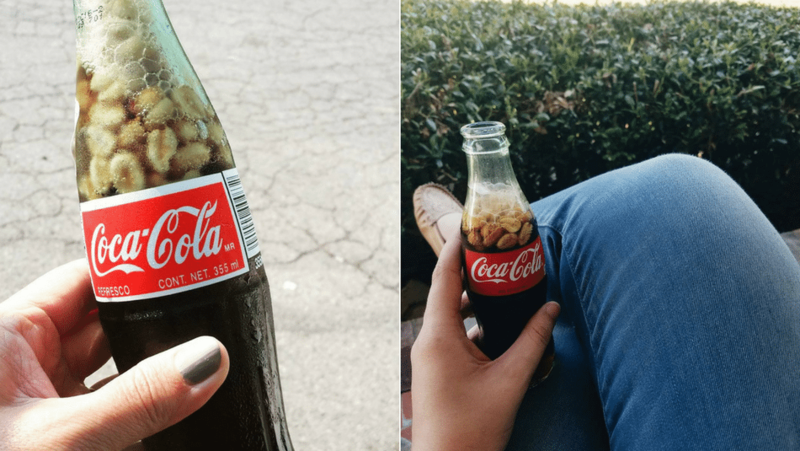 Peanuts in Coke: Have You Ever Tried It? The South is its own entity in the United States, through and through. Whether you're talking about fried okra or your momma's famous bundt cake, there are few things more satisfying than a delicious Southern tradition. The fond memories associated with many a Southern family often stem from experiences shared over comfort food. Peanuts in Coca-Cola is one of those traditions. A staple of most road trips through the West Texas desert, along the coastal bayou of the Gulf of Mexico, winding all the way up to Virginia where the practice of peanuts in Coke seems to lose its fierce, devoted following. So how did this sweet and salty goodness become a huge part of Southern culture? There are theories, but none confirmed. However, before we get into those theories, here's how you do it yourself, the Southern way. Here's how they used to do it. Farmers, blue-collar workers, and families alike would drive to the nearest ice house or gas station to buy an ice-cold Coca-Cola from the huge metal cooler near the register. Here's how you can do it now. Get a glass bottle of Coca-Cola. If you need to try this and absolutely can't find glass, heading to a vending machine is your next best bet. Let's be honest though, if you're doing it, do it right. Always go glass for that cold Coke. Now take a few sips off the top. Enjoy it, and don't think about what soda does to your body. This is for pure enjoyment. Grab a small bag of roasted peanuts. Don't skimp here and go low-sodium, that bag in your hand better be pure salted peanuts. Lance peanuts, Tom's Snacks, or Planter's are preferred, but any local salted peanuts will do. Tear open a small corner of your peanuts and pour those babies right into the Coca-Cola. As soon as you finish pouring, take a big ol' sip. It's amazing, isn't it? You have officially tried one of the coming-of-age experiences of the South, from Florida to Georgia to Mississippi to North Carolina. See, peanuts in Coke is so much more than a good snack to cool you down and pep you up. An inherently Southern tradition, I've heard other variations, from the kind of peanut to the type of soda. The one that springs to mind immediately is popping salted peanuts into a glass bottle of RC Cola in upstate New York. In Colorado, I watched a man pour salted cashews into A&W Root Beer. In Chicago, I heard someone talk about peanut butter and Diet Coke, but I have no idea how that conversation ended because, well, it was too much to consider peanut butter. And in Texas, I've seen quite a few friends drop peanuts right into their glass bottles of Dr Pepper. Now that is a true Texas tradition. As for the theories, there are a few on how it began in the 1920s. The first is that it became a snack for blue-collar workers who often didn't have a clean place to rest their peanuts. So into their Coca-Cola, they went for hands-free snacking. The next theory is that people took to pouring them in to keep one hand free to smoke. The final theory is that people just preferred it that way. So that's the way it was, and always will be.